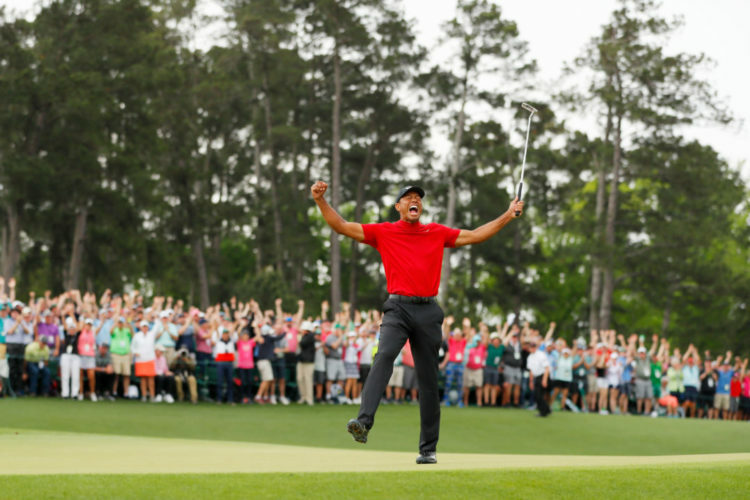 (COVINGTON, GA) –There wasn’t a dry eye in the house as Bridgestone Golf ambassador Tiger Woods put an exclamation point on one of the greatest comebacks in sports history, winning his 15th career major championship at the 2019 Masters tournament. The victory, with Bridgestone’s TOUR B XS golf ball, marks Woods’ first return to the winner’s circle at Augusta National in 14 years and gives him an incredible 5 green jackets for his illustrious career, the second most in history. The win comes 11 years since Woods’ last major championship title, and remarkably it is the first ever in which he’s had to come from behind. Moreover, Tiger’s 2019 Masters triumph is the 5th win of the season for Bridgestone’s award-winning TOUR B golf ball family. Using Bridgestone Golf’s TOUR B XS balls, Woods navigated the tight Georgia Pines and slick greens to card a final round 2-under 70 to win by one-shot over a virtual who’s who of top players in the world. Woods recorded 22 birdies for the week to propel him to his tournament best 13-under par total. The Bridgestone TOUR B XS has been a constant in Tiger’s bag since he first put the ball in play last year, though Tiger has continued to tweak his club selection during that time. The TOUR B XS fits Tiger’s game perfectly as it offers the ideal combination of power, spin and control he demands. The TOUR B golf ball series is a result of Bridgestone’s continued commitment to providing premium tee-to-green performance to players of varying swing types. Bridgestone owns over 800 golf ball patents and fully leverages the company’s heritage of excellence in polymer science worldwide to design the industry’s most cutting-edge golf balls. For more information on Bridgestone Golf’s award-winning TOUR B family of golf balls and the entire Tour team that relies upon them, visit www.bridgestonegolf.com. Based in Covington, GA, Bridgestone Golf USA manufactures premium golf balls, clubs and accessories under the Bridgestone and Precept brands. The company started making golf balls in 1935 and today has more than 800 golf ball design patents. Beginning in 2006, Bridgestone revolutionized golf ball selection with its custom ball-fitting program, identifying a golfer’s ideal golf ball based on personal swing characteristics. Today, as the #1 Ball-Fitter in Golf, Bridgestone has conducted over 2.1 million fittings via a combination of live-fitting, online selection and its B-FIT App. The consumer data gathered from ball-fitting continues to inspire Bridgestone’s innovative new golf ball designs, yielding industry-leading performance products for the entire range of players, from recreational golfers to the best in the world. Bridgestone Golf is proudly represented on international professional tours by icons such as Tiger Woods, Fred Couples, Matt Kuchar, Bryson DeChambeau and Lexi Thompson. Bridgestone Golf USA is a wholly-owned subsidiary of Bridgestone Sports Co. Ltd., headquartered in Tokyo. More information: bridgestonegolf.com.